Initially the fruit grown at Kamen Estate was sold to premium Sonoma wineries. In 1996, a devastating fire tore through the property destroying half of the vines along with Robert’s home. Where others would see this as a tremendous setback, Robert’s credo, “Everything happens for a reason”, held sway. The fire forced him to focus not on what had been lost, but on what could be gained. Out of the experience he decided to stop selling grapes and began to make his own wines. A major replanting began as soon as the ground cooled. Cutting edge viticultural techniques were employed, new selections of Cabernet clones were chosen and different rootstocks were used. 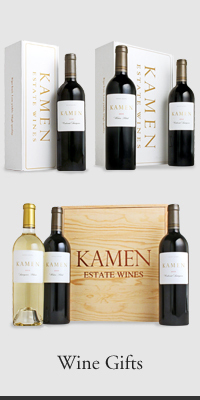 The first release of Kamen Estate Cabernet Sauvignon was in 1999.